The Froggy Match-it phonics app now has an extra level. Level 8 deals with further graphemes for the long vowel phonemes already covered in previous levels. In other words, level 8 has the same sounds that children playing the games have already seen, but which we spell differently. 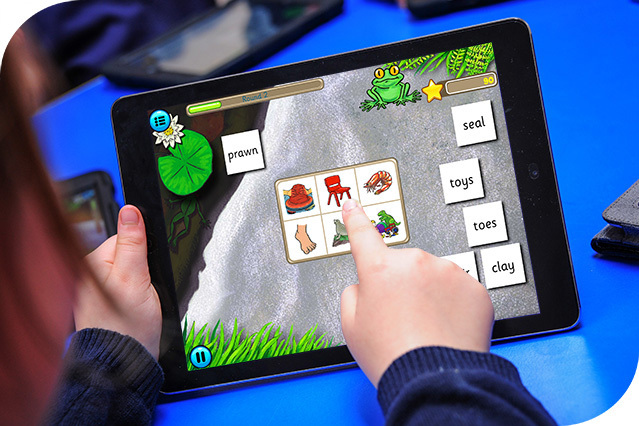 Words and pictures used in level 8 include, for example, tray, leaf, cloud, girl, crew and yawn. Players of the game will have come across these vowel sounds with different spellings: train, sheep, clown, etc. This is an important stage in phonics learning. The next levels of Froggy Match-it will look at all these different spellings in more detail, and should be available soon. In response to your requests, we have enlarged the word and picture image sizes in the matching game and we’ve added word sounds to that game too. Just click on a picture to hear the word. For those of you who have already purchased the Froggy Match-it app, you will get level 8 as a free upgrade. For those of you who don’t have the full app, why not buy it? It’s even better value now! Available on the App Store now. Coming soon on Google Play.